The hot topic of the hour in the Indian Super League (ISL) has been the legal battle began between CK Vineeth and his former club Kerala Blasters' Fan Group Manjappada. The player on Sunday filed a complaint with the police, accusing some members of the Manjappada of spreading fake news. Vineeth said a Whataspp voice note gave out false information about him shouting at a ball boy during the Kerala Blasters v Chennaiyin ISL match in Kochi. He added that the Manjappada was out to ruin his career. Responding to Vineeth's action, Manjappada said the opinions expressed in the Whatsapp Voice Note is that of a fan and do not reflect the views of the group. "The audio clip is not a Manjappada statement. If it is a Manjappada statement, it has to come from our social media accounts or website. Whatever was said about CK Vineeth are not views of the Manjappada's official handle. These are opinions expressed in some Whatsapp groups," a member of the Manjappada said. "We have not promoted the voice note. It's not an official statement from Manjappada. Manjappada always respects the players." the member added. Manjappada has also made it clear that they are not by any means involved in the incident and the police department has only summoned a member of the fan group. "The evidence that the complaint is based on - the voice clip - is addressed to one Mr. Prabhu - the President of the Ernakulam district of the Manjappada. Prabhu has been summoned by the Assistant Commissioner of Police (Kochi). I don't know when he will be going there because he went to Goa for the Goa v Kerala Blasters ISL match," the member, who wished to remain anonymous, said. The fan group has informed Sportskeeda that they will be ready to take legal action against Vineeth, the Chennaiyin FC striker, if the complaint isn't revoked. Manjappada, however, added that it does want to create any unnecessary controversy. "We don't want to create unnecessary controversies. If there is any legal complaint, we will take it up in the same way. We have not lost a single fan because of this incident. In fact, it has grown actually." Manjappada has also denied that its members have a personal vendetta against Vineeth. The member recollected the time when the group was the first to support Vineeth when he lost his Central Government job as an Assistant in the General Administration Department of the Secretariat. The "Best Fan Club in India" has added that it still respects Vineeth as a player. "Whenever CK Vineeth had a problem, I don't know whether he recollects it or not; we are the ones who supported him. We campaigned for him when he lost a job and helped him secure a state government job later. Whenever there was a controversy regarding him, we were the first to support him. As a player we respect him. But he has left Kerala Blasters and for us, Blasters is the first priority." "He himself has said that it doesn't matter who plays for the team, you should be supporters of the club." 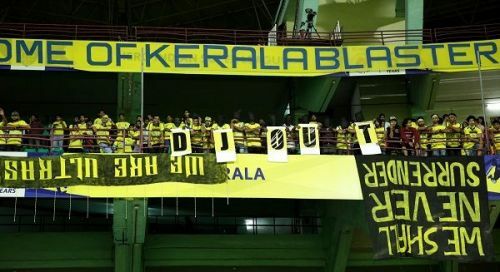 The fan club, well-praised for its non-stop support to Kerala Blasters, has been disappointed this season because of the team's poor display in the ISL. Earlier this season, the group boycotted Blasters' home matches, urging the club management to hire a new coach. The latest issue with Vineeth comes a week after Manjappada was nominated for the "Best Fan Club in India" award for a second consecutive time. The Manjappada also received recognition from the AFC for its support to India during the AFC Asian Cup 2019 in UAE in January.